The St. Mary’s Soil Conservation District purchased its first manure spreader (a 16-foot Gehl side discharge manure spreader – purchased December 14, 2000 and retired in November of 2017) in response to the Water Quality Improvement Act of 1998. This legislation required all agricultural operations that gross $2,500 or more annually, or have more than eight (8) animal units (one animal unit equals 1,000 pounds), to develop and implement nutrient management plans by certain dates. 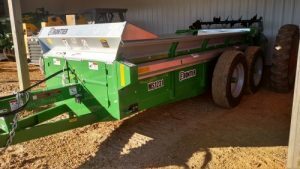 In January of 2019 the District purchased a new Frontier MS1231 manure spreader (pictured) that is available for lease to livestock producers so that they can meet the requirements of their nutrient management plan. In order to lease the spreader, please print out and mail the Manure Spreader Rental Form and copy of Certificate of Insurance to the District or complete the interest form and someone will contact you as soon as possible. Agricultural equipment will be leased to landowners of St. Mary’s County and are to be used within the boundaries of the County unless an exception is approved by the Board of Supervisors. Appropriate requests for exception include properties that overlap county boundaries; St. Mary’s County landowners that farm properties in adjoining counties and for use as demonstration through cooperation with partner agencies. Leasing fees may be evaluated from time to time and modified to cover the costs for repair, maintenance, and future replacement of same equipment. The minimum fee assessed to lease District equipment will be $50.00. ** Prior to leasing District owned equipment, the lessee must complete and sign an equipment lease policy, provide proof of $100,000 liability insurance on tow vehicle, and pay a $50 deposit. The deposit will be put towards the total rental fee and subtracted from the amount owed when the invoice is processed. A new signed rental lease agreement and deposit are required each time a piece of equipment is rented and due prior to the equipment being used. The deposit can be in the form of a check, cash, or credit card. If a credit card is used, the $50.00 fee will show up immediately. In the event that the equipment is not used, the deposit will be refunded. All paperwork (lease agreement, proof of insurance, and deposit) must be completed at the District office between the hours of 8:00 a.m. and 4:30 p.m., Monday through Friday. District equipment staff cannot, and will not process the paperwork or accept the deposit anywhere other than at the office. To arrange for pick-up of equipment please have your receipt available. If you attempt to pick up the equipment without a receipt, you will be denied unless payment confirmation is verified. The St. Mary’s Soil Conservation District Farm Equipment Rental Program is made possible by grants from the Chesapeake Bay Trust (CBT) and the Southern Maryland Agricultural Development Commission (SMADC).